The Botox1-like facial recently has been introduced as a noninvasive clinical treatment that works as a wrinkle corrector to minimize expression lines while smoothing and relaxing the skin. The addition of potent antioxidants strengthens the dermis and inhibits the breakdown of the cellular matrix, resulting in a visibly reduced appearance of fine lines and the prevention of new ones. Embellish Hair Salon and Day Spa in Quincy, Massachusetts, is one of the first day spas in the area to offer the facial. The Botox-like facial was introduced by G.M. Collin Skin Care Inc. in September 2005. “A few years ago, alpha hydroxy was very popular, but it was hard on the skin,” says Jean Lalonde, vice president of G.M. Collin. “This facial attempts to achieve better results, and it is much gentler.” Although there has been some debate about whether Matrixyl2 or retinol is more effective, both are included in the treatment for maximum results, according to Lalonde. If a client decides that Botox is right for them, they can continue with the Botox-like facial to extend the results of the injection. For those who are not interested in the more invasive procedure, this offers a better alternative for the long term. Although the facial does not provide initially drastic results, with continued use it does help to restructure the skin. The Botox-like facial helps to prevent and eliminate expression lines caused by microcontractions of the skin. The complexion is left smooth and relaxed with a rejuvenated and re-densified look. The facial produces not only an instant effect, but also a long-term younger-looking appearance, if properly maintained. During a clinical evaluation, up to 85% of participants discovered a reduction of wrinkle length, and up to 88% saw a reduction of wrinkle surface area. More pronounced surface wrinkles or lines on the forehead, crow’s-feet and frown lines between the eyebrows also were reduced visibly in terms of depth, size and number. Facial muscles also were relaxed, and lines were smoothed. 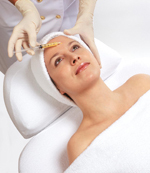 The Botox-like facial takes approximately one hour and costs $150. In order to achieve continued results, four initial facials are recommended, one to two weeks apart. Thereafter, the facial should be booked once a month in order to provide ongoing maintenance. Step 1: The four-step treatment begins with an initial cleansing and exfoliation of the skin, as well as a skin analysis. Step 2: The first product application acts similarly to Botox and is massaged into the skin. Step 3: A freeze-dried collagen mask then is applied with alginate pellicles to boost the skin’s metabolic activity. This is worked into the skin, and, as it is massaged, it turns into a gel. Step 4: A thermal mask then is applied for 20–30 minutes, which further helps the products to be absorbed into the skin. Step 5: During this time, a hand massage is administered, and the esthetician encourages the client to continue relaxing. Step 6: After the time has elapsed, the mask is removed. Step 7: An intensive moisturizer is applied that acts as a sealant, forcing the products into the skin and providing hydration, which boosts the skin’s metabolism. Continued applications of the Botox-like facial will speed the process of increased skin metabolism, as well as accustom the skin to retaining its own moisture. The process is similar to that of many facials, but equipment or extractions are not used. It does, however, involve massage, which actively stimulates the skin. 1 Botox is a registered trade name of Allergan, Irvine, California. 2 Matrixyl is a registered trade name of Sederma Inc., Edison, New Jersey. 3 Argireline is a registered trade name of Lipotec, Barcelona, Spain. 4 Myoxinol is a registered trade name of Laboratoires Sérobiologiques, Pulnoy, France.